A newspaper reporter investigates two cases with supernatural elements: vampire attacks in Las Vegas, and a 120 year-old Jekyll and Hyde-like killer in Seattle. This disc contains the two pilot TV movies for the popular ABC series Kolchak – The Night Stalker (1974-75). In both movies and in the TV episodes the formula was pretty much the same: wise-cracking newspaper reporter Carl Kolchak investigates an unusual story and discovers something supernatural, much to the annoyance of his skeptical boss. If that sounds familiar, it’s probably because the series was a big influence on The X-Files. (Darren McGavin subsequently appeared in a couple of episodes of The X-Files and Millennium). The scripts for the two TV movies, (by Richard Matheson, author of key genre novels The Incredible Shrinking Man and I Am Legend, and one of the stalwarts of the Twilight Zone series), are witty and sharp, and consistently entertaining. The direction, by veterans Curtis and John Moxey, is fluid and confident. All this would count for little, though, were it not for the engaging performance by Darren McGavin. Fans of American TV series of the sixties and seventies will undoubtedly get a kick out of small roles and cameo appearances by Richard Anderson (The Six Million Dollar Man), Larry Linville (M*A*S*H) and Al Lewis (The Munsters and Car 54, Where Are You?). Horror icon John Carradine and the Wicked Witch of the West herself Margaret Hamilton (in one of her last appearances) also feature. Both films look very good, especially considering the age and nature of the source materials. The mono audio is typical TV audio, lacking in dynamic range, and rather compressed, but is very acceptable. 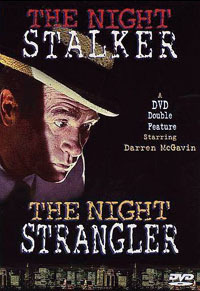 The version of The Night Strangler on the DVD is about quarter of an hour longer than some versions that were shown in the US after its original premiere. One minor problem with the disc is worth reporting. In The Night Stalker, Kolchak is paged as he is enjoying a poolside drink with Bernie Jenks. This dialogue is missing from Anchor Bay's print, so Kolchak is seen to react to something the audience hasn't heard. It’s a shame that this disc came out so early in the evolution of the DVD format, since it would now be a prime candidate for a more lavish presentation, (perhaps with commentaries and a newly-shot featurette). Many of the key contributors are still alive, and seem more than happy to cater for the TV series’ cult following. It’s also something of a mystery as to why no-one has released the TV series (the twenty episodes would comfortably fit on four double-sided dual layer discs). UK viewers would be especially grateful, since the last time the series was given a terrestrial broadcast (in 1991) it was treated rather shabbily (many of the episodes had their credits removed to make it seem part of a longer theme-night-type presentation, for example).